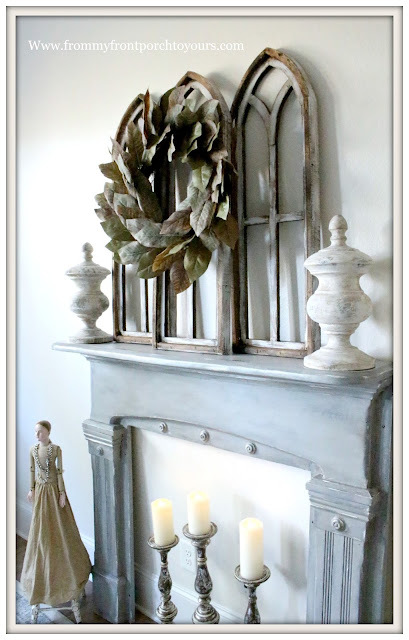 I have always dreamed of finding a vintage mantel for our master bedroom. Mr. Front Porch tagged along with me treasure hunting one Saturday and purchased this beauty for me for Christmas. I was so excited! It didn't always look like this though. This is how it looked originally. White and full of chippy goodness...at least from afar. Yes, it had chippy goodness to it and I loved the sage paint peeking thru but overall it was in need of some major loving. It was just plain dirty looking and no matter what I did I could not get it to come clean. I even took a magic eraser to it to try and get it to looking decent. 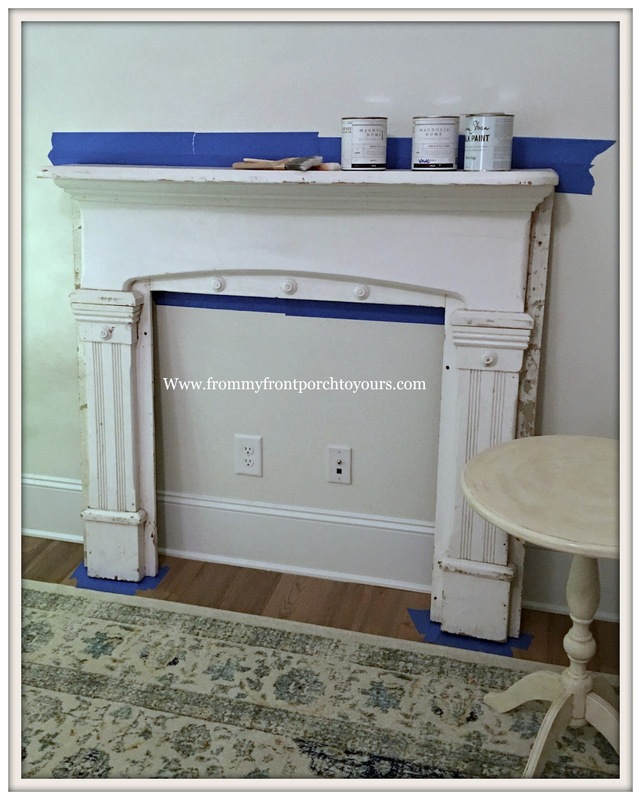 Since I didn't have any luck I decided I was going to paint the mantel. Gasp! 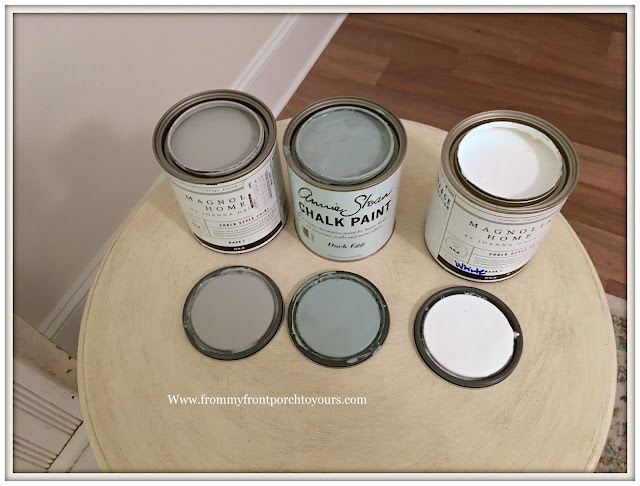 Since my chalk paint collection was pretty much non existent from the move because of it all drying out I decided it was the perfect time to try out the Magnolia Home Chalk Style Paint Line by Joanna Gaines. Oh she has some beautiful colors to choose from! I narrowed down my selections to these four. It was hard though! I wanted all the colors. I also found a can of Annie Sloan Duck Egg hiding so I brought it out as well. 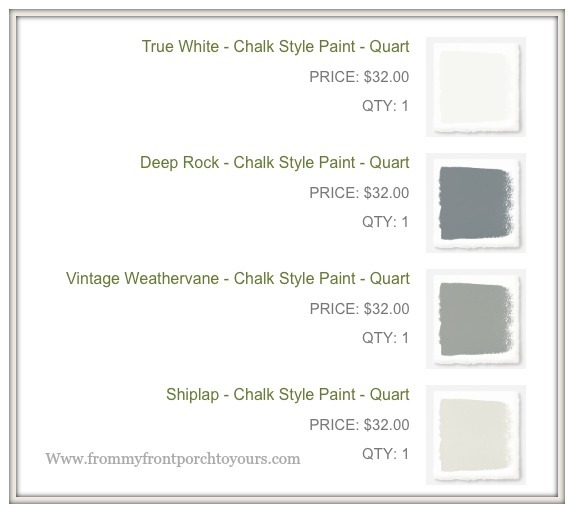 The Magnolia colors I ended up using were True White, Deep Rock, and Vintage Weathervane. I brought in the Vintage Weathervane after I was not achieving the desired look I wanted. The mantel is SUPER heavy so I just tapped off the wall/floor and painted it right in our bedroom. There was no rhyme or reason to what I was doing. I didn't want a full layer of any of the colors. I just layered um lightly here and there. The Magnolia paint does not smell which is a plus. The colors are rich as well as the thickness of the paint. 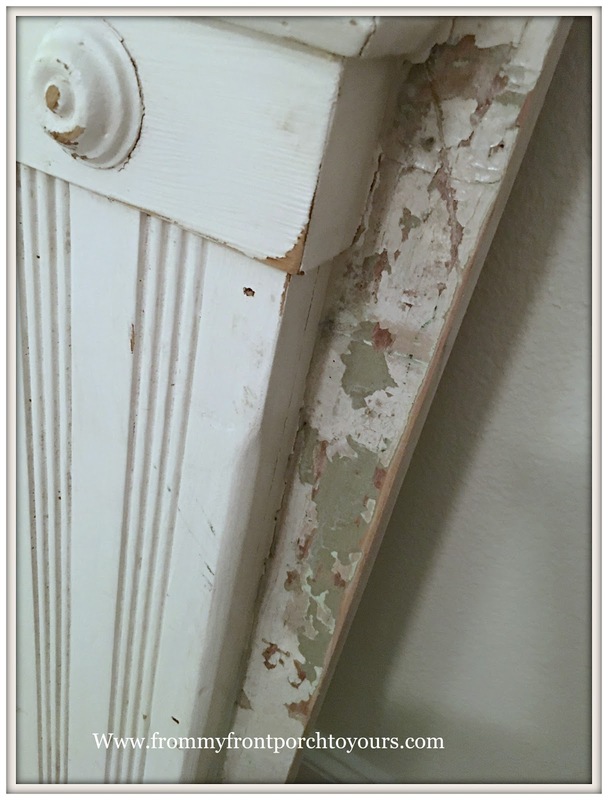 To me it has more of the consistency of a latex paint but it dries super fast. It does not have a chalky feel to it what so ever. After I finished layering and blending colors as well as rubbing some of the paint off I used dark wax and clear wax to get more of the aged look I was after. My favorite wax to use is Miss Mustardseeds. At first I was not sure I liked how dark it turned out but after a few days I decided that it was just perfect for our bedroom! Soon we will be attaching it to the wall. I also need to decide how I want to treat the opening. Brick is a thought, shiplap another or maybe even a tin. I am just not sure yet. 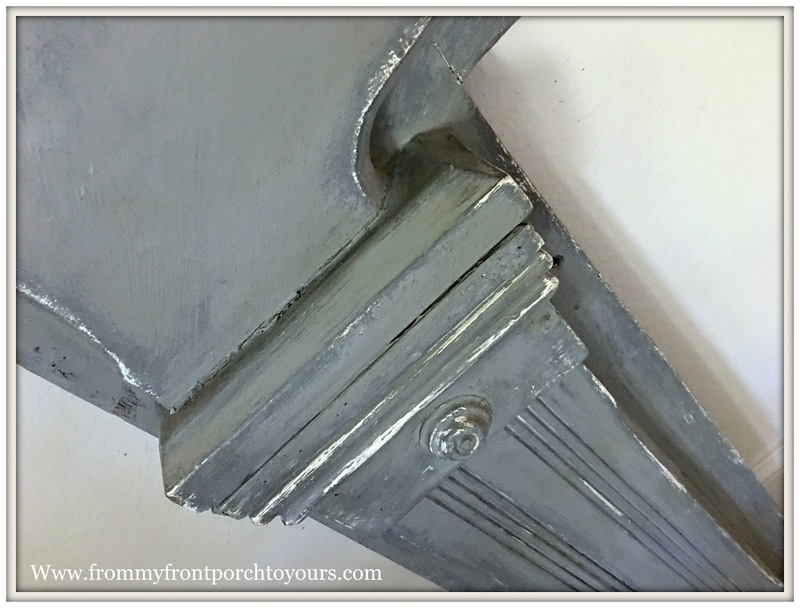 As for my review of Magnolia Home Chalk Style Paint, the colors are fabulous! In all honesty though I prefer to work with other styles of chalk paint. 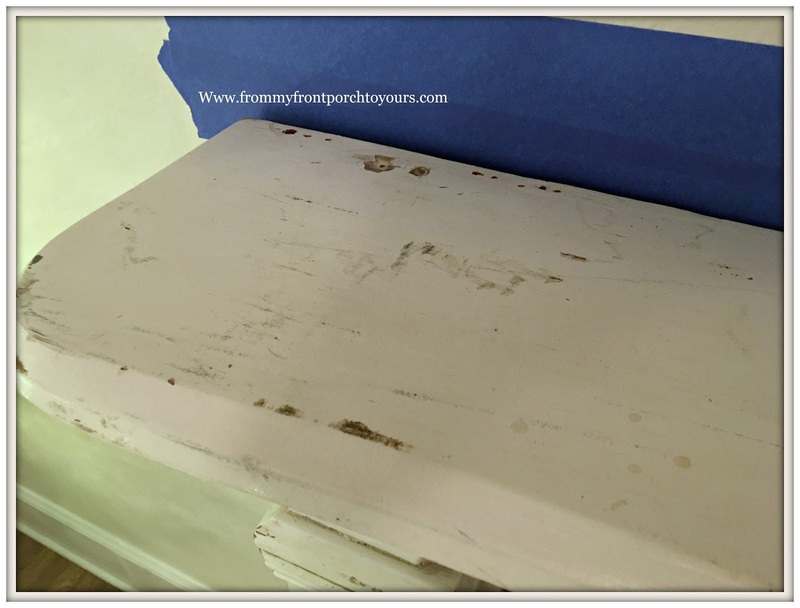 Magnolia Home Chalk Style Paint does not really give you the texture of chalk paint or the depth. I also found it harder to not have brush strokes. Now this was just my first attempt at using it and there is always a trial and error phase. Who knows, maybe I will end up liking it more on my next project. Thanks Penny! Yea, I need to start my stash of Chalk Paint. I miss not having them on hand. I love the way it turned out. What a great find! 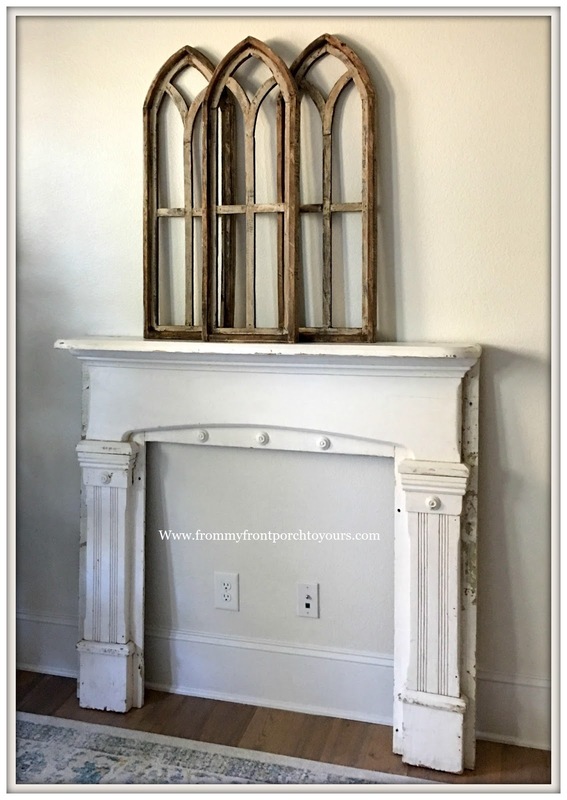 It was nice to hear your thoughts on the Magnolia chalk paint too. Thank you Mary Jean. If someone has never used Chalk Paint before then they probably would like it. Love, love, love it, Pamela! It really has a nice European feel to it, and looks gorgeous the way you have styled it. The rug is the perfect compliment. Thank you so much Jane! Enjoy seeing your grand babies over on IG! No matter what, you should love it. Right? The paint looks amazing! Beautiful. It looks amazing in your room. 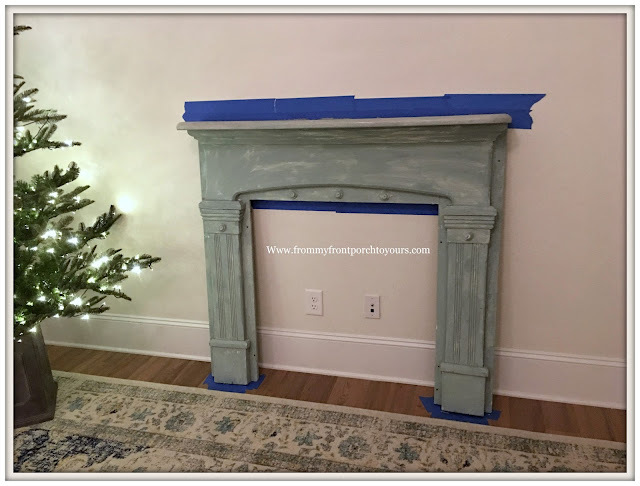 It's good to know about the chalk paint. 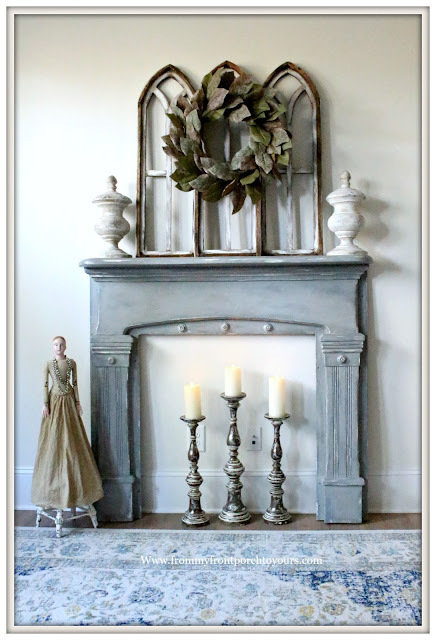 I love how you decorated your mantel. I agree, your rug is fabulous. Thank you Ivory Jean. I purchased it from Joss & Main but it is available thru a bunch of the sale sites. I love the color! Nice to hear about your experience with this chalk paint too. Can you tell me the brand/style name of your rug? Thank you Dee Ann! The rug I purchased from Joss & Main but I have seen it on various other sites like Overstock, Zulilly, Rugs USA I believe and Wayfair. I unfortunately do not remember the name. Each of those sites all have their own name for it sadly enough. I look forward to seeing what the opening will be. I want to do this is my master bedroom as well. I'm sure you'll make OUR mantel look great! Thank you Kim! It really adds personality to the space. Hi Pamela! 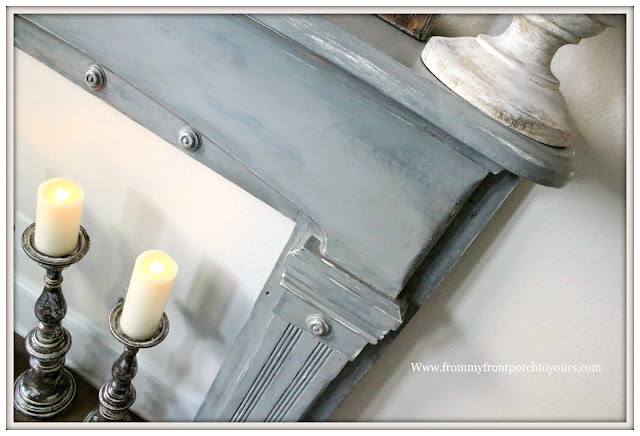 Mantle looks awesome! 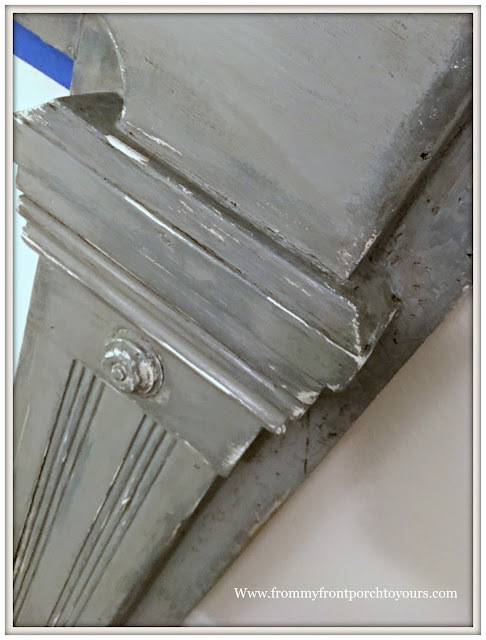 Could you tell me if the vintage weather vane color from magnolia is like light gray? I can’t tell from the magnolia site and they don’t have the sample peel and stick. $32 feels like an awful lot for a color I’m not sure I’ll love.